The drive towards visual perfection is evident throughout the new award-winning one bedroom apartment built behind the heritage-protected 1920s State Savings Bank in the heart of Melbourne, with Big River Group’s Armourpanel plywood critical in realising the architect’s detailed vision. The visually striking new home has been perfectly executed by architect Jackson Fitzroy-Kelly of JFK Design for his clients – an empty-nester couple wanting a stylish and contemporary home that could also be used as a studio and office space. While the couple deliberated over the decision to build a new dwelling at the back of the building, as well as a two-year delay awaiting council approval, the architect used the time to develop a clear aesthetic and vision for the home, with materiality key to the project’s success. The transition from the original heritage of the former bank to the new structure has been creatively articulated with inside and out beautifully contrasted through the selection of textures and tones of building materials. The exterior palette is one of smooth concrete, black zinc, original red brick and galvanised steel columns, which accentuates the warm timber tones of Big River Armourpanel Spotted Gum plywood used extensively within. 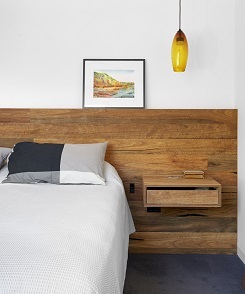 The plywood has been a linking feature throughout the home, connecting each expertly crafted space and adding a depth and richness to the overall design. The spotted gum front door offers the first hint of a warmer interior, which is carried through to the fully resolved cabinetry, window reveals, detailed joinery and kitchen island. 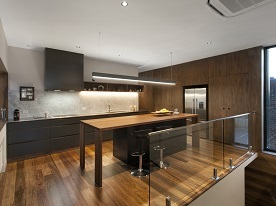 In addition to the use of Big River Armourpanel Spotted Gum, a sustainably sourced timber, the consideration of light through the use of glass accentuates the warmth of the interiors, with custom-designed blown glass pendants by artist Laurel Kohut, creating moments of mood and magic within the home. For natural light, careful placement of windows create areas of abundant daylight to stream in, while north-facing 2.7 metre-high glazed sliding door panels blends indoor and outdoor living, where views stretch over the leafy treetop lined residential landscape. A native Australian timber, the Big River Armourpanel Spotted Gum decorative plywood is a precision-engineered structural product with a unique construction method that sees each of its five layers of Australian eucalypt hardwood sheets bonded together in a cross-ply manufacturing process to form a strong, solid and stable panel. Its durability makes it ideal for use in hard-wearing areas, including flooring, wall paneling, screening, cabinetry and ceiling linings. 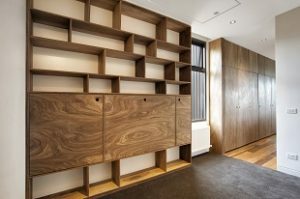 The architect has carefully integrated joinery into the design to act as furniture, with examples seen in the bedroom’s window seat/storage unit and in the study’s book and concealed desk unit, a reflection of the plywood’s applicability and strength. 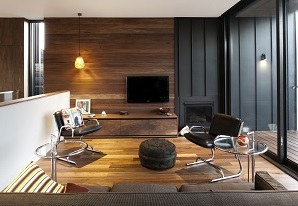 As a result of the creative articulation of the brief and its vision, the project, known as ‘Taking it to the Bank’, won three citations in the 2016 Building Designers Association of Victoria awards: Residential Design of New Homes in $500,000-$1 million, Interior Design – Residential, and Excellence in the Use of Glass.